Feature:	7X-45X magnification power with crisp sharp images	Super widefield high-eyepoint optics	widefield of view	4" (100mm) working distance	Sturdy all-metal pillar stand	Powerful 56-LED ring light with dimmer	This stereo microscope has a 56-LED ring light that offers super widefield optics and 7X-45X zoom magnification power with a cool light illumination system. It is an ideal instrument for industrial inspection and/or biological lab applications. This microscope is perfect for gemologists, manufacturing engineers, dental lab technicians, and anyone in electronic and semiconductor industries. 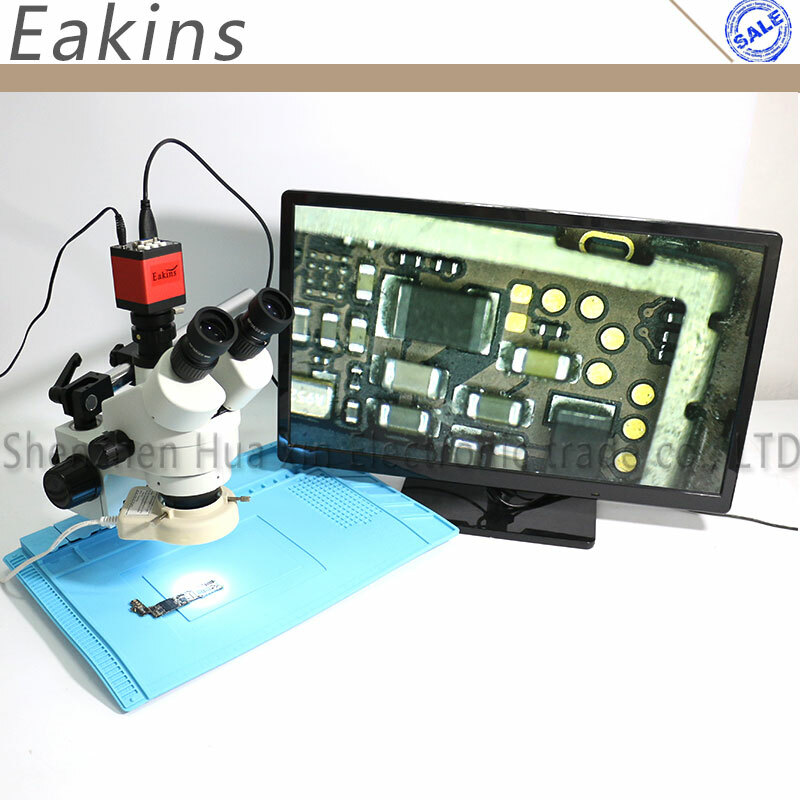 An excellent stereo inspection microscope with intensity-adjustable 60-LED ring light	7x-45x super wide zoom magnification power	Bright cool light 56-LED illumination system	High resolution with great flatness and contrast, giving sharp and clear images	Binocular head with 45 degree inclined 360 degree swiveling eye tubes	Sharp stereo erect images with a wide field of view	Crystal clear original true color microscope images	Dual eye tubes with adjustable diopters	Large working distance	Sturdy all-metal table stand	Accurate alignment reduces eye strain for longer periods of viewing	Full optical glass elements	Precise ground glass lenses	Full metal chrome-plated mechanical components	Adjustable interpupillary distance	Rubber eye-guards included	Specification:	Head: 360 degree rotatable 45 degree inclined binocular	Eyepieces: 30mm super widefield high-eyepoint WF10X/20MM	Objective Zoom Range: 0.7X-4.5X, using the Barlow lenses	Working Distance: 4" (100mm)	Diopter Adjustment: +/- 6dp	Interpupillary Distance: 2-3/16" - 2-15/16"(55-75mm)	Round Plate: 3-3/4" (95mm) in diameter	Stand: (380x 200 x 260mm)	Illumination: 56-LED Ring Light	Power Input: 110-240V, 50-60HZ, Automatic Switching	Accessories: Paired eye-caps	Feature:	​	High Quality, High Resolution, Clear Images 1/3” CMOS Industry Cmos Camera. It can Show the live image directly on any HDMI monitor , Projector or TV. It build in digital crosshairs and color control, add line in the pictures, freeze ,Mirror, Rotate, Negative,Compare function Supply VGA,HDMI HD video,Two output ports Specification: Model: Camera with HDMI VGA two output Sensor: 1/3 inch 13MP Image format: jpg Image resolution: 1280* 1024 (for HDMI), 1280 *720 (for VGA) White Balance: Auto Light: Auto Color: Color Negative: Support Morror: Left/right,Up/Down Freeze: Support OSD: English/Chinese Line: different color,8 horizontal line , 8 vertical line,any positions Package incluede:	1 x Trinocular stereo microscope	1 x Pair of Super Widefield 10X Eyepieces	1 x 56-LED Ring Light with Adapter	1 x Pillar Big size metal stand	1 x Focusing Rack	1 x Pair of Eye-Guards	1 x Dust Cover	1 x 450*300mm Table mat	1 x Universal bracket	1 x Microscoop Camera	Eyepiece and monitor can be seen at the same time.